I'm sure every crafter/card-maker out there can relate to me when I say that I had one of those "Gotta Make It Work" moments while creating this card. So...... while making this card for our new challenge at Word Art Wednesday I ran into that very problem. I was in a pinch and had to work with what I had. Our sponsors for the new challenge at Word Art Wednesday are The Project Bin, a sweet stamp store that's offering one lucky winner a $25 gift certificate to their shop; AND...... Iralamija Etsy Shop is our digital sponsor for this challenge; and their sweet owner, Bety, is offering one very lucky winner some shabby-chic adorable Iralamija digital goodness (one digital collage/sheet of choice). Now, those are two AWESOME sponsors; and I really hope that YOU will stop by and play along in this (always) Anything Goes Challenge. 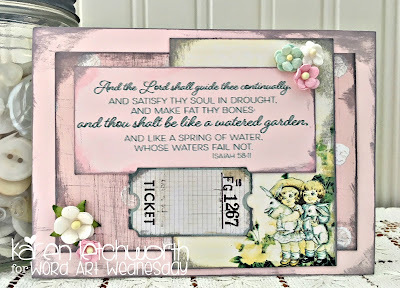 The little journalling card image I used is a Freebie from (sponsor) Iralamija Blog and the scripture I used is the "freebie" Word Art file from Word Art Wednesday. As I went to print out the scripture and journalling card, I quickly learned that my printer ribbons (BW and color ribbon) needed replacing. Well, I needed to finish up this card because we're getting ready to hit the road and leave town. Soooooo.....I had literally had to "Make It Work". I figured, "Well, since the image is already a bit "fuzzy" and faded because of the ribbon issue, I'll just ink it even more with a smokey vintage ink and make it appear as though I was trying to achieve that look all along. right? LOL (....maybe not). It's definitely faded! 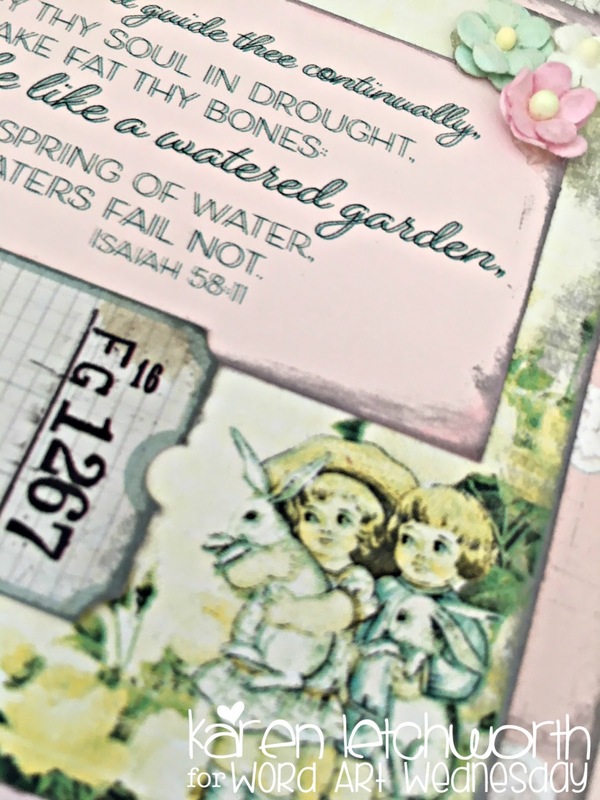 This sweet digital freebie from Iralamija Blog is truly SO bright and adorable. I wish my ribbon had been new and that I could have had the bright vibrant colors in this sweet card. You really need to take a peek at it (click on link). In fact, all the images at Iralamija Etsy Shop are SO sweet. They have a wonderful vintage homespun feel, and there's lots of inspiration on the Iralamija Blog. So anyway, I inked my papers with Tim Holtz Distress Ink Spun Sugar and Hickory Smoke; and I made these faded images work (for the most part). I also added a Prima ticket and a few Sweetheart Blossoms. I really hope that you'll stop by Word Art Wednesday to play along with us. Not only can you pick up these fabulous freebies, but you can play along in our current Anything Goes challenge for your chance to win one of our AWESOME prizes. I really hope you will link up with us. And please don't forget to check out these fun sponsors and their awesome shops. Thanks for visiting me today! Great work Karen - thanks for showing us and for having the WAW challenges too! I really like how it's muted. I know what you mean about having to make it work in a pinch, and you really pulled it off this time. How cute!